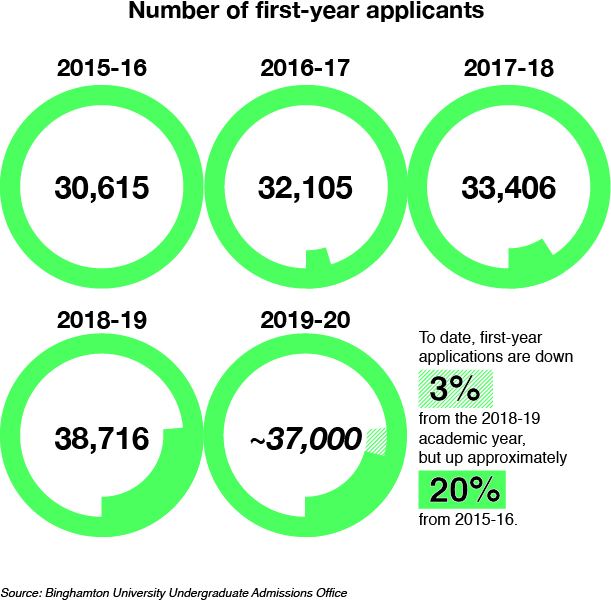 For the 2019-20 academic year, Binghamton University is seeing a decline in the number of incoming applications. For the 2015-16 academic year, applications numbered at 30,615, for 2016-17, at 32,105 and, for 2017-18, at 33,406. Although applications increased steadily throughout these years, the 2019-20 numbers have fallen short of continuing the pattern. According to Krista Medionte-Phillips, director of undergraduate admissions, in comparison to last year’s record high, counting at 38,716 applications, first-year applications are down by about 3 percent, with slightly more than 37,000 submitted to date. Medionte-Phillips wrote in an email that the downturn in applications is not unique to BU, with schools across the State University of New York (SUNY) system seeing similar decreases. According to Medionte-Phillips, the University is looking into why applications may have decreased for the upcoming academic year. Ryan Yarosh, senior director of media and public relations, wrote in an email that the University has still received an impressive number of applications for the class of 2023. “I think it’s important to keep in mind that the University received over 37,000 applications for over 2,000 spots as Binghamton continues to build a strong academic reputation as a place where the best students in the nation — and the world — come to learn,” Yarosh wrote. But despite the decrease, some applicants still considered the University one of their top choices, including Meagan Hui, 17, of Livingston, New Jersey, who applied to BU via early action and was accepted in February. She will start at the University next fall, and said she chose to apply because her mother and aunts are alumni. Amy Donovan contributed reporting to this article.